The National Association of Women in Construction— San Diego #21 is sponsoring the NAWIC Education Foundation (NEF) Design Drafting Competition for High School and College students. The competition provides recognition to contestants for creative design, successful problem solving and craftsmanship in preparing architectural drawings and renderings. The drawings may be created utilizing any computer aided design (CAD) program available to the contestants, drawn by hand, or may consist of a combination of computer aided and hand drawn plans. Entries will be evaluated for detail, accuracy and originality of work. Contestants will be judged at the local level with the local winning entry in each division being submitted for Regional and National Competition. Contestants will be furnished with an architectural problem developed by a design professional, a site description and plan, and a list of required drawings and information. Judging will be performed by construction industry professionals. Future Construction Leaders Foundation believes the challenge of meeting future workforce demands emphasizes the importance of education, training, and preparing our youth for careers in construction. Prefer to download the form? Click here. Won’t you please join us in sponsoring this motivational competition? If you do not want to pay online please select OTHER under Sponsorship Level and send us a check. Make checks payable to NAWIC SD Future Construction Leaders Foundation and mail to PO Box 880655, San Diego, CA 92168-0655. Questions? Contact us. 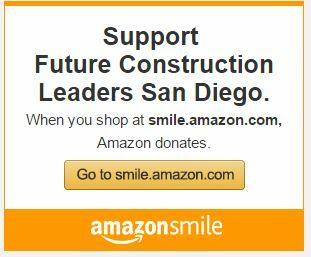 NAWIC SD Future Construction Leaders Foundation is (EIN: 47-3107267) a Charitable 501(c)(3) foundation.